Laugh out Loud, Misfits VS Aliens. From the guys that brought you the hilarious TV sci-fi adventure Red VS Blue and RWBY, Rooster Teeth brings us a fresh look at saving the universe. Written by and staring Burnie Burns (The Outfield) and directed by Rooster Teeth co-founder Matt Hullum. In the late 1970’s the Earth manages to decipher a message sent by the alien race the Antareans. Which foretells the coming of the Alien race the Worg who will destroy the Earth. These benevolent aliens will send a suit of armour for the champion of Earth to wear in the battle against the Worg. The government implements Project Perseus (after the Greek mythological figure who fought using gifts from the gods). The gifts from the Anatareans will not arrive for many years so one infant is chosen to be trained to be the champion of Earth. 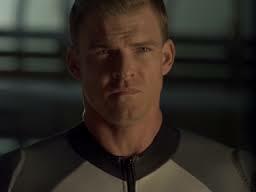 Adam (Alan Ritchson, The Hunger Games: Catching Fire) goes through the program with a top scientist and trainer watching him at every step until he is the epitome of a warrior. Now 38 years after the message it is time for the armour to arrive. Small town America Officer Hagan (Burnie Burns) is going to a disturbance at a party, where he finds Zach (Michael Jones, Fairy Tail) the high school jock along with his girlfriend Mindy (Allie DeBerry, Mission Air) Hagan’s daughter. Zach is having a fight so Hagan takes him in his police car to the station, but on the way they spot illegal fireworks exploding in the desert. They go to investigate and find drunken Woody (Gavin Free, RWBY) and Herman (Colton Dunn, Unidentified) letting off the fireworks. Hagan gets the left arm that allows the wearer to create a shield, Woody gets the helmet that increases his intelligence, Zach gets the right arm and it is an energy cannon, Herman gets the boots which make him ultra fast. The military are not pleased when they turn up at the crash-site, but there is nothing they can do, so Colonel Emory (Steve Shearer, A Texas Funeral) has Adam to train the now named ‘Lazer Team’ in just four days. Let the fun begin, This is just good light-hearted comedy Sci-Fi, what more could you want, four idiots and an alien warrior and the saftey of the planet. With alien possession, and robot controlled soldiers it has everything required apart from the popcorn, so sit back and enjoy.